Buy DnDoggos a Coffee. ko-fi.com/dndoggos - Ko-fi ❤️ Where creators get paid by fans, with a 'Buy Me a Coffee' button. 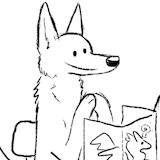 DnDoggos is a free webcomic about dogs playing Dungeons and Dragons! DnDoggos is based on my four real life dogs, Magnus the Dungeon Master, Tonka the Bard, Pickles the Fighter, and Zoey the Cleric. The comic updates once a week on Fridays. Hey! Welcome to the DnDoggos Ko-Fi page! You can directly support the creation of Dungeons and Doggos by making a donation. Not only does it help me, the artist, but it keeps the real life dogs happy and healthy, too! Thank you for your support. Secured Payments. Support goes to DnDoggos's account. Upgrade DnDoggos to a yearly Gold Membership with a one-time payment.